1970 held at Parma, Ohio. Rutenschrorer came from the losers bracket and won the last 5 games in 12 hours, including eliminating the defending champs Hialeah Dots 6-5 and then winning both final games 2-1 and 4-2 over Raneu Tire behind Pitcher Marsha Reflogie. Reflogie had 7 pitching victories and also drove in the winning run in that final game. Ida Hopkins won her third National MVP award. This was the second time she played so well, she was named from the non-winning team. In 1968, She won it finishing in 4th place and this year as the Runner-up team. 1970 held at Jones Beach, New York, on August 1-9. 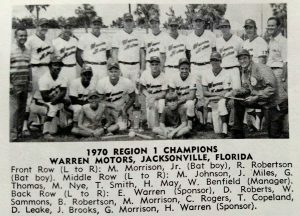 No World Series Played in 1970, The USSSA reorganized the World Series into a new format where the 1970 East and West World Champions meet in the 1971 World Series best of 7 format. 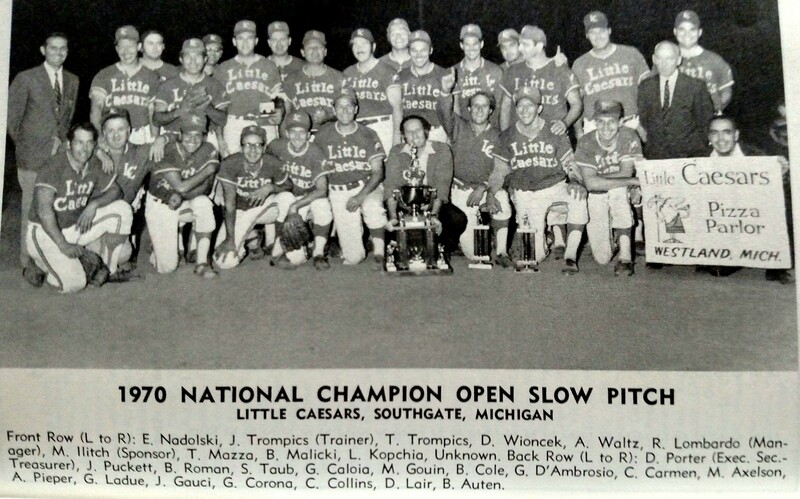 In 1968 and 1969, the USSSA held World Championships, then in 1970 they changed the format to have a separate Eastern and Western World Championship, with the two winners to meet the following year in the USSSA World Series. 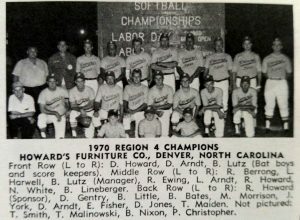 From 1971 through 1973, the Eastern Champ would meet the Western Champ in a best of seven to determine the USSSA World Series Champion. The Separate World Championships were held in September of the previous year and the World Series was played in June of the year listed. 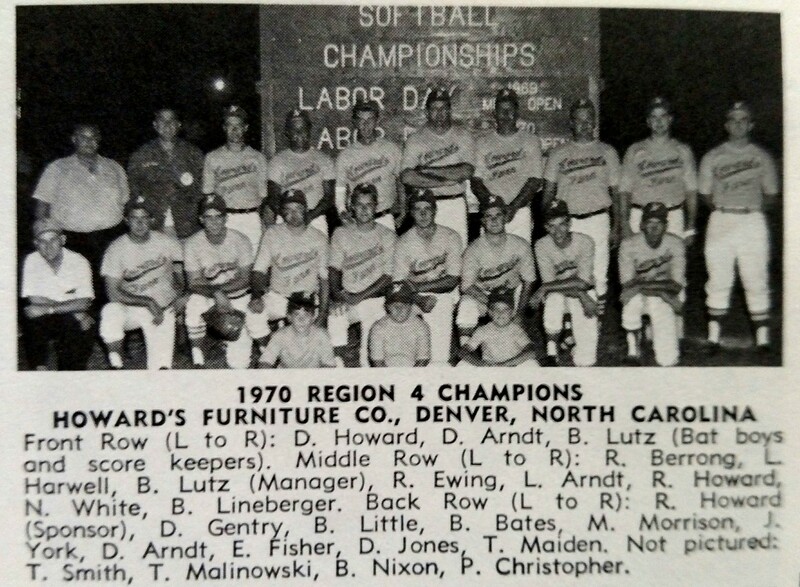 In 1974, 8 teams, which included not just the winners of the Eastern and Western World Series, but the runner-ups as well. Also included were teams from the new Central World Series. 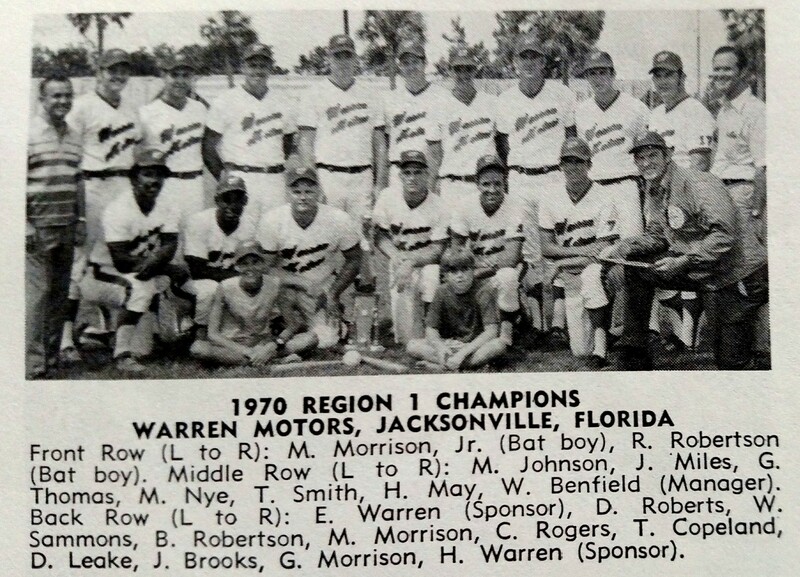 In 1975, the first USSSA World Series all-world team was named. Previously, the all-world teams were made up of from the separate divisional world series. Goettl’s came on strong in the championship game to defeat Big Apple 9-0 behind the pitching of MVP Larry Harrell. Harrell was 5-0 on the during the tournament to lead Goettl’s to a berth in the USSSA World Series. Harrell had previously shutout Kelly’s Sporting Goods in the winners bracket semi-finals before beat Big Apple 7-5 in the winner’s bracket final as Denny Bush and Jack Beavers both went 3-4. Big Apple finished the season with a 92-18 record, while Goettl’s was 54-9. M&M defeated Kelly’s in the loser’s bracket 3-2, before being eliminated by Big Apple 12-10. 1970 held at Southgate, Michigan. Little Caesars beat Copper Hearth in the winners bracket final 32-9 (9 HRs) and again in the championship 40-11 (17 HRs). Three Players combined for ten of the homers, Tex Collins and Bob Auten both hit 4 and Bill Cole hit 3. Carl Neubauer (19-28, .678, 3 HRs, 10 RBIs) and Fred Duke Maas (16-26, .615, 5 HRs, 18 RBIs) led Copper Hearth. 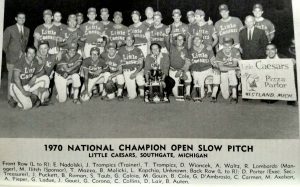 Bob Auten (17-25, .680, 7 HRs, 15 RBIs, 15 Runs scored) and Bill Cole (14-25, .560, 10 HRs, 16 RBIs) of Little Caesars also had big tournaments. Little Caesars hit 34 Home runs in its last 3 games. 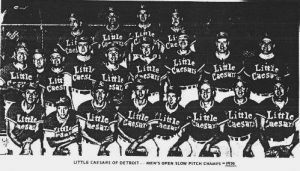 In the final championship game, every Little Caesar starter hit at least one home run.